PLG ARTS is pleased to present a perfect summer evening of the Arts in Prospect Lefferts Gardens. We are presenting TWO events, minutes away from each other, all within the neighborhood. Starting at 6pm, join us at Tugboat Tea Company (546 Flatbush Ave) for an opening reception featuring the landscape paintings of Noel Hefele. Noel paints familiar landscapes with an evocative brush stroke. Many of the paintings are of places a mere stones throw away from the art show. PLG Arts is collaborating with Tugboat Tea Company, a great local coffee shop, to curate a monthly Local Artist Series. For more information on this project check out our website. 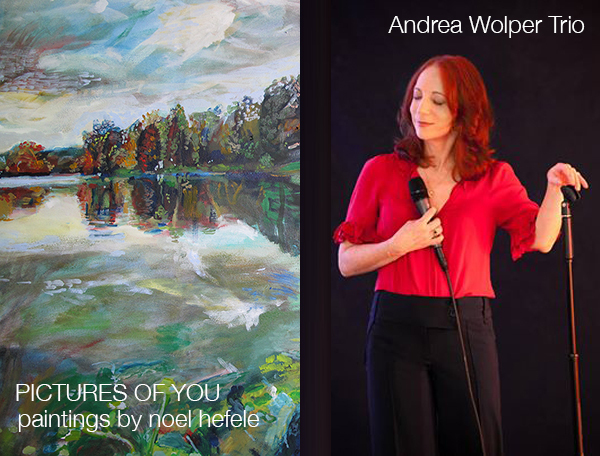 Beginning at 8pm, Andrea Wolper Trio willperform at the Inkwell Cafe (408 Rogers Ave).Andrea is giant singer with an inventive, thrilling, appealing musical vision. With her long-time trio Michael Howell on guitar and Ken Filiano on bass, this singer/improviser/songwriter invites audiences to a spirited ride through terrain both familiar and full of surprises. PLG Arts is collaborating with the Inkwell Cafe to produce bi-monthly Jazz concerts, featuring a fabulous array of musical talent. For more information on this project check out our website. We look forward to seeing you! No need for the subway—you can walk! Are you on facebook? you can RSVP for the art opening here and the music performance here.